In the interior designer trade, there is a standard known inside Russia and the world over as the vomit test. The World of Interiors usually passes; Architectural Digest often fails. This isn’t what it sounds like – no disparagement intended of the design or designer as such. No Sirree. The test is simply whether the design portrayed is so crowded, with so many different and overlapping patterns, that if you vomited, noone would notice. Any day now we shall be returning to the preservation of that plain, almost severe 80-year old style known in Moscow as Constructivism. No problem with rooms designed in that style – vomit on the wall, or floor, and it will be spotted immediately. But consider the living room in the illustration – can you spot the chuck? It doesn’t really matter if you can, for this is now the private property of Dmitry Rybolovlev; he’s very good at cleaning up. Since Deputy Prime Minister Igor Sechin first began applying a variety of pressure on the control shareholder of Uralkali, the potash miner, Rybolovlev has been buying fancy houses. In Florida, he bought a beachside place which set the record at the time for the most expensive single-person residence in the US. In the name of his daughter, Rybolovlev is leasing the most expensive apartment in Monaco. Had he and his wife Yelena Rybolovleva not fallen out, the vast hole they were digging in the Geneva crust might have turned into the biggest two-person residence in Switzerland. Had things turned out differently, he might also have bought something nice in San Francisco. But all he left behind there was a pen in the lieutenant-governor’s pocket. The Rybolovleva v Rybolovlev divorce has already triggered a court-ordered freeze on Rybolovlev’s assets. But that hasn’t put a dent in his ability to buy the AS Monaco Football Club. That was last month’s news. Now, according to an investigation by the New York Observer and its real estate reporter, Elise Knudsen, he has bought the penhouse at 15 Central Park West for $88 million. Here’s her story. Dmitry Rybolovlev has been a busy man lately. He is in the middle of a bitter divorce that could cost him more than $6 billion (when finalized it will be the world’s costliest divorce), but he has still found the time and funds to buy a struggling AS Monaco soccer team and, it turns out, the most expensive home in the history of Manhattan real estate. Well-connected sources have confirmed to The Observer that the mystery Russian chemist behind the sale of Sandy Weill’s $88 million penthouse at 15 Central Park West is indeed Mr. Rybolovlev. The flaxen-haired Russian originally trained in medicine but began buying industrial concerns in the early 1990s during Russia’s wildly unregulated privatization period. Ultimately running one of the country’s largest potash fertilizer concerns, Uralkali, Mr. Rybolovev began to establish his formidable fortune. In 1996 he was accused of murdering a fellow businessman and spent close to a year in prison. Ultimately acquitted for lack of evidence, Mr. Rybolovlev went on to quietly corner the potassium fertilizer market in Russia, raking in bundles of rubles for his efforts. As of March this year, Mr. Rybolovlev was the 93rd richest person in the world with a net worth around $9.5 billion. Were he to move in full-time, that would make him the fifth richest New Yorker, behind David Koch, Mayor Bloomberg, John Paulson and Ronald Perlman. Should his basketball-loving comrade Mikhail Prokhorov finally buy a place here, that would knock Mr. Rybolovlev down to sixth place. This is not the first time a rich Russian has set real estate records this year. The current belt is held by Igor Krutoy, a Russian composer who paid $48 million for a massive spread just across the park at the Plaza. Meanwhile, 15 Central Park West—the best building ever built—has attracted fellow foreigners at the top, where the building’s developer William Lie Zeckendorf sold another penthouse for $40 million last December to a Taiwanese-born American GPS mogul. That had been the highest sale on a per-square-foot basis, but Mr. Rybolvlev surpasses that by a few dollars. Not more, you ask? Well, his 6744-square-foot spread is more than twice as big. Speaking of big, this sale also trumps the biggest residential real estate sale ever in the city by a cool $35 million—J. Christopher Flowers’ purchase of the Harkness Mansion for $53 million in 2006. 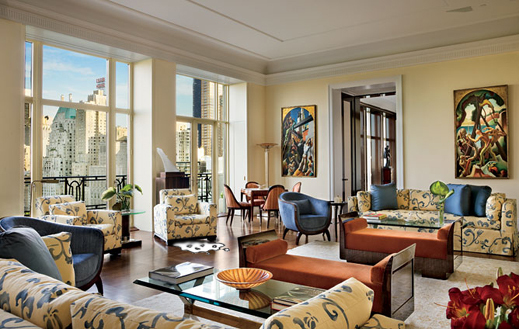 Inside Mr. Weill’s palatial skyline sprawl, for which he paid $43 .7 million in 2007, Mr. Rybolovlev will enjoy 10 massive rooms overlooking Central Park and a 2,077-square-foot wraparound terrace. Brown Harris Stevens broker Kyle Blackmon describes the space in his listing with one line, really the only line, necessary: “The Penthouse at 15 Central Park West.” Brown Harris Stevens declined to comment. That also means Mr. Weill can still keep an eye on Mr. Rybolovlev, including whatever he might be up to in the unusual elliptical-shaped master bedroom. There are three other bedrooms, a skylit gallery, a den with a bar and a library with a wood-burning fireplace. Closets total 17, seven of which are walk-ins. The fertilizer kingpin is no stranger to staggering real estate. In 2008, he purchased Donald Trump’s 33,000-square-foot Florida estate, Maison L’Amitie, for $95 million. Last year he liquidated over $6 billion his company’s stock after it was announced the company would soon merge with another Russian potash fertilizer concern. Meanwhile, Ms. Rybolovlev is attempting to wrest control of the Florida mansion, and Forbes reported that Mr. Rybolovlev has been living “on the tax shelter island of Cyprus” for the past several months. The old Mediterranean getaway—classic oligarch move! With the soon to be ex-wife fuming about his many dalliances in court (including several on the couple’s $72 million motor yacht) Mr. Rybolovlev has been trying to keep a low profile. That has not always worked. Last summer, a minor scandal ensued after Mr. Rybolovlev gave California Lt. Governor Gavin Newsom a gilded Louis Vuitton pen. The Huffington Post contacted John Helmer, a Russian correspondent for South Africa’s Businessday who has reported extensively on the Russian tycoon’s life. “Secrecy is next to cleanliness in his order of importance,” he told HuffPo of Mr. Rybolovlev’s furtive business dealings. Funny way to keep things private, buying a Manhattan apartment. Moscow may have the most expensive market in the world, but New York’s is still king.